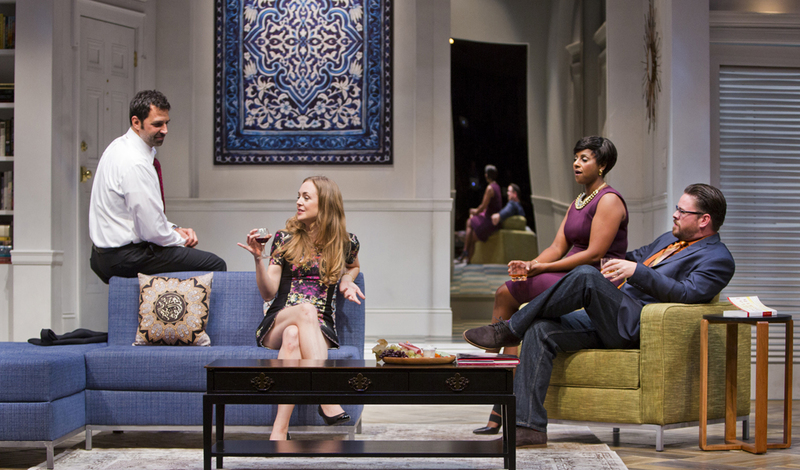 In the telling, it could well sound like the trappings of a joke, and that’s possibly what 2013 Pulitzer Prize for Drama winner Ayad Akhtar was intending. 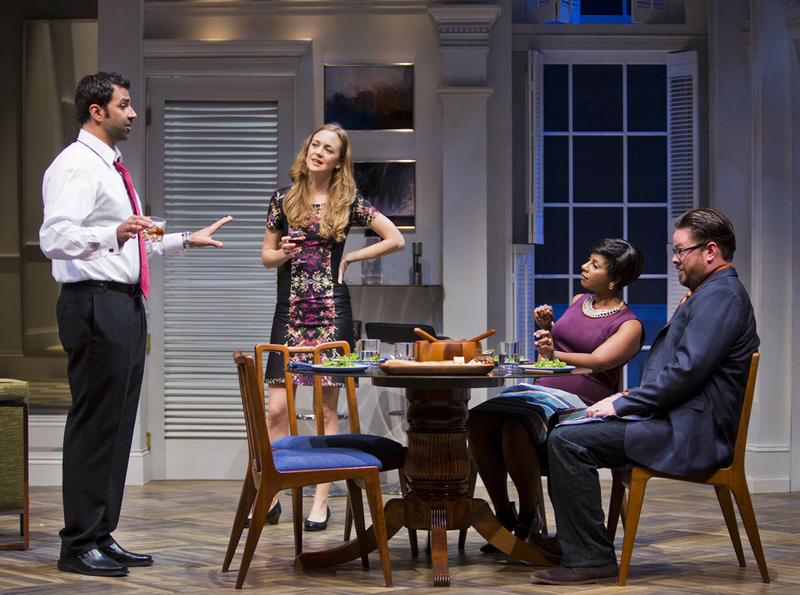 In the riveting new play Disgraced, fresh from its Broadway and London engagements, a WASP, a Jew, an ex-Muslin, and an African-American woman have dinner. What follows is something unexpectedly volatile. One of the characters makes a jaw-dropping admission, and from that point, nothing between any of them will ever be the same. Running at just a few minutes shy of ninety without intermission, Disgraced moves full steam ahead in four scenes, plowing through the kind of themes and subjects one should never discuss in good company, namely religion and politics, though more specifically Islamophobia, Muslin-Americans and a crisis of religious and cultural identity. The action takes place in a palatial apartment with desirable window space overlooking New York’s Upper East Side. It’s post-9/11. Up and coming corporate lawyer Amir Kapoor (Elijah Alexander) and his equally up and coming artist wife Emily (Allison Jean White) will be hosting a dinner party later in the fall, but that’s a few months away. The play’s first two scenes concentrate on setting up future conflicts, events that are mentioned more in conversational passing that seem largely inconsequential, except they’re not. They’re the kind of actions that will later ignite something disastrously explosive from which there is no survival, particularly for Amir. “It’s in the Quran,”states young Abe Jensen (Vandit Bhatt). “You can hide your religion if you have to.” Abe, a character who we learn was born with the name Hussein Malik, has assimilated himself into western culture and society, something to which the lawyer Amir can also relate. In the first scene, an exchange between the young man and Amir reveals Abe’s concern regarding the arrest of a local imam. Abe believes that the charges against the arrested religious leader may take on the form of prejudiced persecution. It’s Amir’s wife Emily who encourages her husband to go to court, consult, not in any official capacity, but to simply be there, observe and lend support. Two weeks later, Amir is concerned for his career. He’s on an ascending fast-track, but he’s now upset that a quote he made to a reporter of The New York Times while attending court in support of the imam may alter company partners’ perspective of his loyalties, as well as dragging their name into a controversial case of which they had no professional association. Writer Akhtar presents these events in such a relaxed, conversational manner it’s as though they’re secondary to more important things, such as Emily’s artistic tastes for Islamic culture and traditions in her work, or Amir’s career trajectory as a partner with his law firm. But it’s three months later, at the dinner party with colleague Jory (Nicole Lewis) and her husband Isaac (Richard Baird), who also happens to be Emily’s art dealer, that disappointments are revealed, alcohol is consumed, and things are said that should never be mentioned. To explain the arc of the story is one thing, but to state anything more of what happens and why at the dinner party is to do an audience disservice. The power in Akthar’s writing, his first stage play, is in the discovery of hidden feelings and the exploration of racial profiling, the submission to assimilation for career survival, and ultimately the consequences of suppressed honesty, something ingrained that can never be entirely concealed. It’s not just what Amir says, it’s something he does, and you can’t be anything but shocked at the incendiary action he takes. Akthar presents much with humor, as with the opening moments where Amir poses for his artist wife dressed in his $600 Charvet shirt and tie and boxers. Visually it’s funny, but the moment is even more amusing when we discover that the inspiration for Emily’s painting comes from Diego Velaquez’s Portrait of Juan Pareja. Check the program and you’ll read that the Spanish painter was depicting the portrait of a Moorish man born into slavery. Director David Ira Goldstein skillfully handles the lengthy dinner party in way where every line uttered and each action taken comes at us like an edge-of-your-seat thriller. It’s spellbinding, concluding in such an unexpected manner you may find yourself questioning whether you truly accept that such an educated and upwardly mobile character such as Amir would say and do what he says and does. Ordinarily, the answer would be no, but writer Akthar has carefully stacked so much against the character – a staggering career disappointment, personal cultural resentment, possible self-loathing, not to mention a lot of drink that can’t help but unlock hidden emotions – that you at least recognize with some understanding the occurrence. There can never be approval, but in the way insight often comes through good playwriting, we can at least view things through a prism of comprehension never before considered. All five performers are cast well, each flawlessly representing their type in a way we assume the author intended us to view them, but it’s Alexander’s portrayal of the conflicted Amir that stands out. 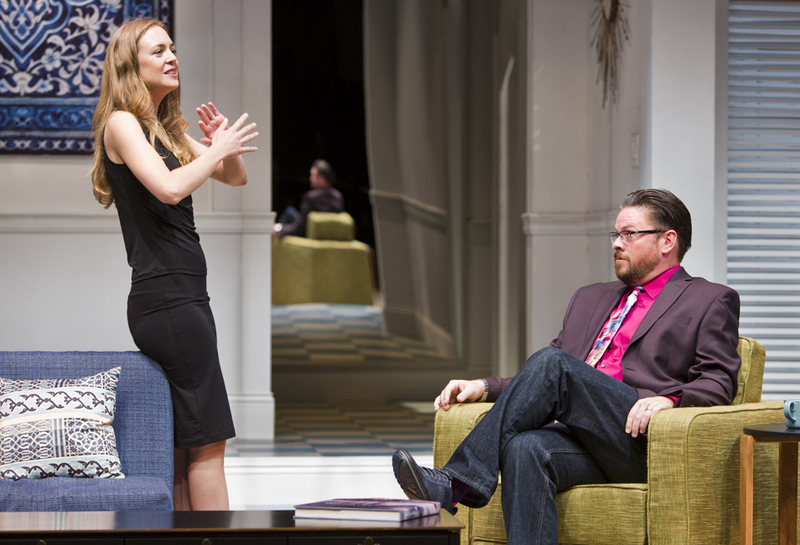 John Ezell’s scenic design nicely captures the setting of where and how an educated and upwardly mobile couple would live, while Brian Jerome Peterson’s sound creates the required musical atmosphere needed during scene transitions. 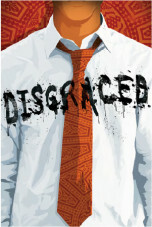 Not everyone will like Disgraced. It’s the kind of play that those with a working affiliation for the theatre as both an industry and an art-form will admire for its performances and narrative construction more than someone with simply a passing interest in theatrical entertainment. At the fadeout of the first scene, many may wonder where the piece is heading, even though all things discussed, even if they seem only in passing, will later reveal themselves to be of major importance. But there’s something else to consider, and this has everything to do with real-life timing. I doubt whether any audience member at the Phoenix Herberger Centre opening performance of Disgraced was unaware of the horrific circumstances that occurred in Paris prior to the weekend. While Akthar’s play has nothing to do with the cowardly terrorist action that unfolded in the beautiful City of Lights, the themes and actions explored in this exemplary and perhaps cautionary Arizona Theatre Company production gives the audience an unexpected sense of comprehension. It has nothing to do with acceptance, but like Amir’s action at the dinner party, you may potentially view the event in a way you never before considered. 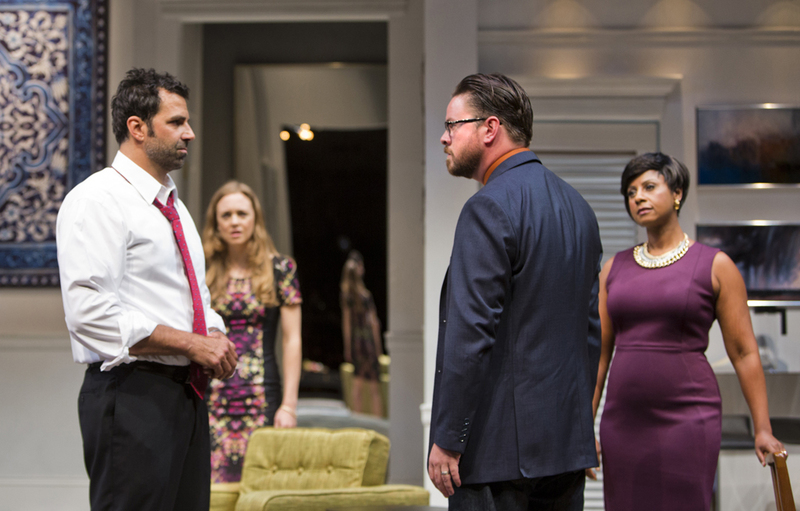 Such is the power of Disgraced, and more importantly, such is the relevancy of great theatre. For more regarding times, dates and tickets, CLICK HERE for the ATC website.